How Long is a Triathlon? If you or a friend have been thinking about doing a triathlon, you might be wondering what distance to do. We’re going to walk you through each of the triathlon distances, who does them, how long it takes and how to approach them. What are the distances in a triathlon? The shortest distance, which a lot of people start out with is called the super sprint or it might be called the try-a-tri. These races are really, really short, like really short. The super sprint only takes in between about 40 and 60 minutes. The distances for this vary a lot depending on the course, but typically they’re in the neighborhood of around 300 meters for the swim, about13 kilometers for the bike and about 3 to 5 kilometers for the run. It’s an excellent way to get into triathlon. If you’re starting from no athletic background at all I would definitely recommend starting with one of these types of races. The next longest distance is called the sprint triathlon. Sprints are still short, but they’re normal short. This is a 750 meters swim, a 20 km bike and a 5 km run. Pro triathletes are doing this in around 52 minutes. The average age group athlete might take about an hour and 20 minutes to an hour 30 minutes, going up to about two hours. This is a very good distance to start out with as well because it’s over fairly quickly, you never get too far away from the finish lines so there’s always people to help you if you need. If you’re thinking about becoming a more competitive age group triathlete, Sprint triathlon is a very good place to build your speed from. You don’t have to worry a ton about nutrition in sprint triathlons. This distance is nothing to sneeze at, it’s a very difficult race to do because it is so quick, your lactic acid really builds up in your body. It’s painful, just not quite beat your body down painful like an Ironman, it’s painful in a different way. Youth triathletes actually race this distance and if you see the looks on their faces you know that this is no cakewalk. The next longest distance is an Olympic triathlon. Olympics just seems kind of like a normal distance for many triathletes. Olympic triathlon is 1500 meters swim, a 40 km bike, and then a 10 km run. This is what you see in, fittingly, the Olympics. Pro triathletes are doing these in about an hour and 49 minutes. The average age group athlete might do it in about two hours and 40 minutes going all the way up to 3.45, almost four hours in some cases. An Olympic distance triathlon is still not a bad place to get started in the sport, because an Olympic distance triathlon is getting a little bit longer than those short distances, you do have to worry about things like nutrition, proper pacing, your race strategy, whether you go harder in one sport or another. But then the nice thing about the Olympic distance triathlon is that your body has a lot of time to settle into each sport. In some cases, let’s say you get off the bike and you’re not feeling very well and your body’s cramping as you start to run, you’ve got enough time to turn that around and actually have a really good run if you can settle your body down and get into a nice pace. There’s the opportunity for disaster, but also the opportunity to fix problems if they come up. This distance triathlon is certainly one that you have to train for, it’s a lot harder just to go and enter it without training at all. But it’s right on the edge of being able to get through it coming in cold. The next longest distance is a half Ironman or a 70.3 because it’s 70.3 miles. Total distance for a 70.3 half Ironman is a 1900 meter swim, a 90 km bike and then a half marathon, 21.1 kilometers. Pro triathletes will be doing half Ironmans in about three hours and 45 minutes. Age group athletes can take probably in between about five and six hours on average. This is where cutoff time starts coming into play. You have an hour and 10 minutes to finish the swim, five and a half hours past the start of the race to finish the bike and eight and a half hours past the start of the race to finish the entire race. That’s very generous and not a lot of people should ever have an issue coming into that cutoff time. This is a distance of triathlon where you really have to worry about the preparation before you get to the start line. A lot of people absolutely love the half Ironman distance. They say that it’s their favorite distance of triathlon. It’s probably the longest distance that you can go and still make it a race. It’s not nearly as acutely painful as the sprint and Olympic races, it’s painful in a different way, more in the aspect of managing your body, making sure that you don’t beat yourself down. But it’s about as long as you can go in a race effort while still incorporating some of the logistical issues of nutrition and training and strategy. It’s fun in a sick and twisted way. The granddaddy of them all which has inspired many an M-Dot tattoo is the Ironman distance race. The Ironmans are pretty long. This a 3.8 kilometers swim, a 180 kilometers bike and a full marathon, 42.2 kilometers run. It’s horrible, just a horrible distance. Pro triathletes are now doing this distance in as quickly as seven hours and 45 minutes, and the longest amount of time that you can take because you get booted off the course if you don’t finish it by midnight, is 17 hours. That’s right, some people are doing a triathlon in the entire amount of time that most of you are awake throughout the day. This varies a little bit from race to race, but age group athletes are giving about two hours and 10 minutes to complete the swim, about eight hours and 10 minutes to complete the bike and about six hours and 30 minutes to complete the marathon. The Ironman distance race is what you see on TV, this is what’s held in Hawaii at the Ironman World Championships in Kona. This is the big Kahuna of the races. There is a huge amount of planning that goes into racing an Ironman triathlon, as far as nutrition, getting to the race, training for the race, preparing for the race, paying for the race, qualifying for the race, registering for the race, packing for the race, acclimatizing for the race. That all happens before you even have to worry about surviving the race. There’s an incredible amount of preparation that you have to get into. If you’re doing the Ironman distance triathlon as your first race, you crazy man. A double ultra triathlon, a triple ultra triathlon, quadruple ultra triathlon, a quintuple ultra triathlon, a deca ultra triathlon, a 10 days triathlon, a double deca ultra triathlon and a triple deca ultra triathlon. These races are really far. 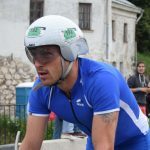 I’m going to tell you about the triple deca ultra triathlon. It’s a 114 km swim / 71 miles, a 5400 km / 3400 miles bike ride, and a 1260 km / 780 mile of run.